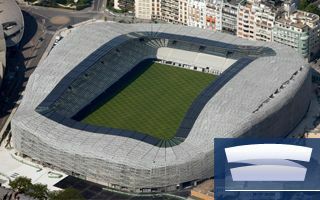 Stade Jean Bouin has been dominated by Parc des Princes (across the street) for decades and this was sure to remain unchanged as a new rugby stadium was planned in this location. After all, Parc des Princes is a listed monument and its monumental concrete shell dominates the neighbourhood. Meanwhile, the new Jean Bouin was designed to hold only 20,000 people, giving it no chance to challenge the neighbour’s dominance. But with Rudy Ricciotti’s unique design a new dialogue of two concrete bowls was created, making these two stadiums a pair hard to match in the world of sports. On one hand the rugged, sturdy Parc des Princes with its dated, but still strong silhouette. On the other dynamic, asymmetric, lightweight, almost fluid blob of the new Jean Bouin. They’re so different, yet both are covered with concrete. In the case of Stade Jean Bouin it’s the high-performance Ductal concrete. To be more precise: 3,500 panels of concrete mesh, each perforated seemingly light, even if raw at a closer look. All of them installed over the steel inner frame, with glass supporting the concrete on the roof to provide cover from rain. The highly perforated shell of Jean Bouin invites both sunlight and ventilation inside, giving a very intensive and intriguing shade both across the promenade inside and over the stands. Only a modest inner ring of the roof is completely covered with glass, not to impede sunlight access. Capacity may not be impressive, but meets the expectations of one of Paris’s top rugby sides. Single-tiered stands resemble the Spion Kop, creating a compact, intimate environment. Two floors of hospitality facilities are available in the north, but they barely intrude the neutral, grey seating bowl. The crude climate of Stade Jean Bouin is broken by pink accents, representing the colours of Stade Francais. The stadium isn’t crude at all in terms of facilities, no way. Its appearance hides top level facilities, both sporting and commercial. This unique approach at a concrete stadium stands out in the world of sports infrastructure. Did it impress you enough? Vote for Stadium of the Year 2013!